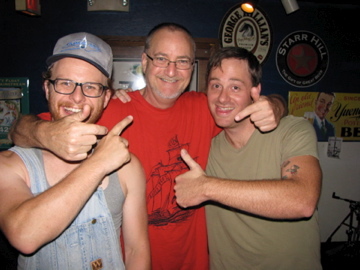 Zog Daddy Jimmie with Will (L) and Brad (R) of The Wiley Fosters! Hey! Open to everyone 21+, Zog’s is having a Potluck For No Damn Reason on Tuesday, January 18th, at 7pm with special guests The Wiley Fosters* (William Dawson of Squirrel Nut Zippers, Alcazar Hotel, and Katherine Whalen and her Fascinators and Brad Porter of Alcazar Hotel and Katherine Whalen and Her Fascinators) going on around 8pm. Currently there are about 30 people signed up for the Potluck, which means there will be tons of food, fun, great people, and no snobbery happening on Tuesday. If you’ve never been to Zog’s, you need to check it out. Pool tables, arcade games, board games, specialty New Orleans-style cocktails and weird art everywhere make for a fun and interesting night out, and plus everyone’s friendly and really excited to meet new people. If you haven’t been to Zog’s in while, you really should stop by to see the changes. It’s still a neighborhood bar, but now with a new divey, artsy twist. If you’re a regular at Zog’s, you’re already signed up for the Potluck, so just show up at 7 or whenever you can! Since so many of us work in the service industry, there will be another small influx of people coming around 10 or 11, so don’t feel bad if you have to come late! *Note: in the above band links, WIlliam is the guitarist and Brad is the drummer. 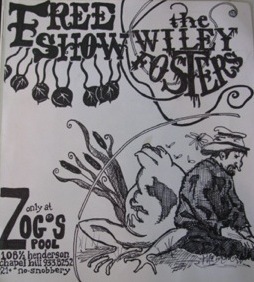 The Wiley Fosters are a 2-piece blues-rock band who play a mix of incredible originals and much-loved covers, and Brad’s a bartender at Zog’s, so he’s definitely someone you should come meet! The show is free but the guys work for tips, so, if you can, throw bucks in the box and rock out!